The backdrop that wedding photographers dreams are made of! After arriving and touching base with both Alyssa and Trevor I wasted no time. 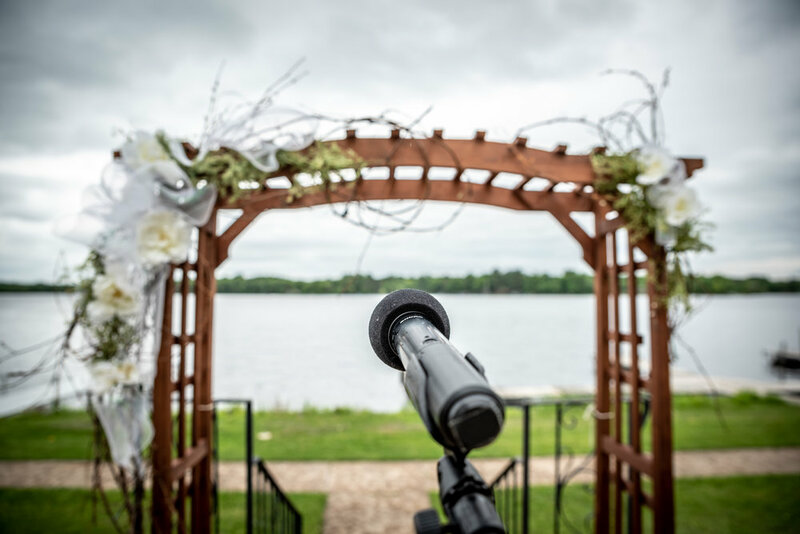 Although, it's not as traditional to have an outside ceremony, not located in a church, it still serves the same purpose for the task at hand. One is not better then the other when achieving the goal of the day. 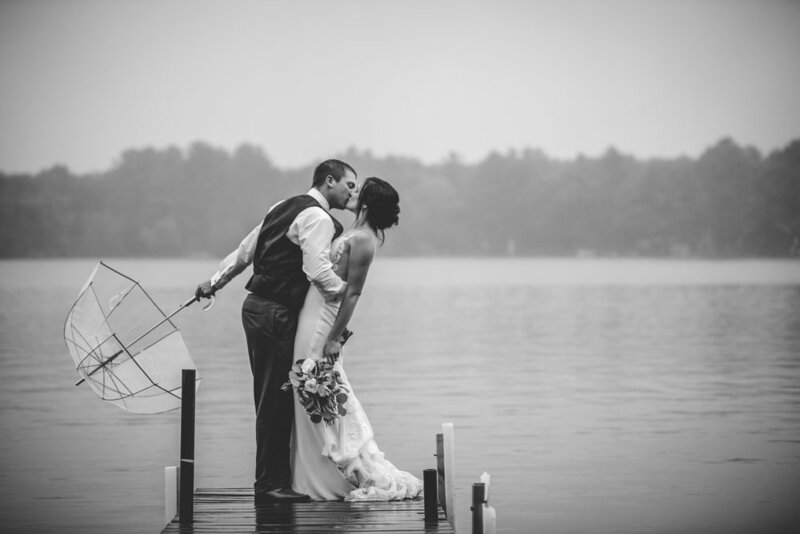 But as a wedding photographer based out of Wisconsin nothing inspires me more then an outdoor ceremony. The possibilities with natural light, backdrop and not to mention the space to move when shooting! This Venue could not have offered a better setting. The prep photo process is something I enjoy greatly. 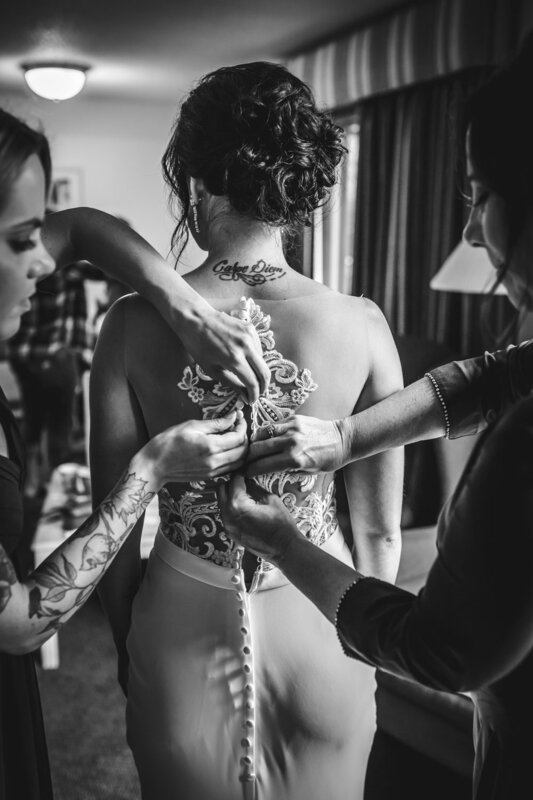 From getting to know the wedding party and just all the amazing moments that happen behind the scenes. Oh yeah, and the wedding dress! Lets face it...You will probably only only wear your wedding dress once. So lets take some amazing photos of it! Lighting not right inside? take it outside! Now is the time in the program where I need to mention an amazing photographer. Ruben Showed up ready to go and always captures stunning images. I am honored to have him shoot by my side! - Please check him out and give his page a like for me. Once Ruben arrived he also wasted no time and jumped right into prep photos with the ladies while I was having some fun with the men down by the lake. I have to say when it comes to weddings, this group of ladies and gents sure know how to have fun! Coming from a 27 year old who feeds off the energy of others, I could not have been blessed with a better wedding party. Fast forward 1000 hilarious and stunning images later it was time for the ceremony! 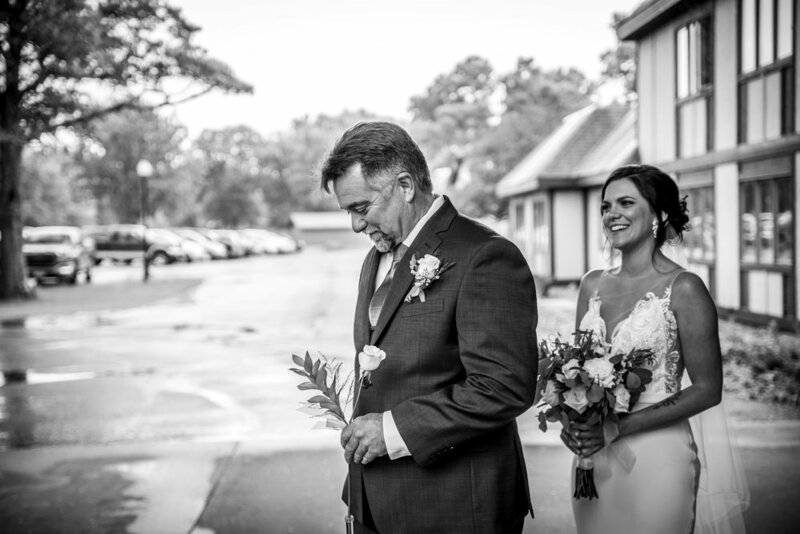 But not before Alyssa's Dad got to see her one more time before he walked her down the aisle. I will be the first to say that I cry at almost every wedding. But come on Dad, a white rose for your daughter signifying the last time you will see her as a single women... I cant even see through my viewfinder my eyes are so blurry from tears. The decision was made shortly before the first look with her father to push the wedding back twenty minutes to let the rain pass and I could not have agreed more! 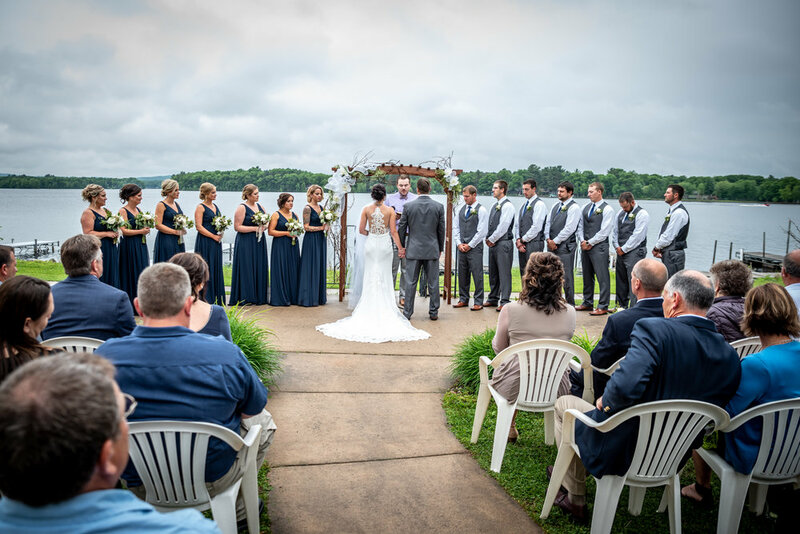 With a beautiful lakefront ceremony, no one was going to complain about a short wait to make sure that this beautiful bride and handsome groom had the wedding day they worked so hard for and pictured for weeks and weeks. From a photographer standpoint I wanted that light, I needed that backdrop. I was so happy they got the ceremony they had planned! Located just two blocks to the west is a local waterfront bar. Not only did they offer cold drinks for the wedding party but an awesome setting down by the lake. I'm thinking everyone wins! As Ruben and I scoped out the location while the wedding party was loading up, we noticed right away a small cluster of pines right across the road from the bar. As it looked to be private property it never hurts to ask, so I walked up to the little blue house and knocked. Shortly after a little old lady opened the door and was not quite sure what to make of me. It's not every day you have a guy walk up to your door with two massive cameras strapped to my sides with what looks like leather tack from a horse saddle. But I explained myself and she was more okay with us using her property. 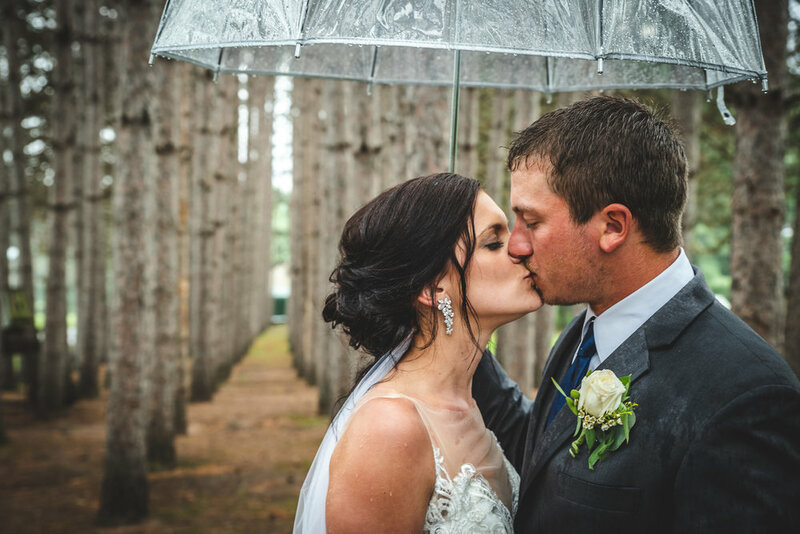 I could go on for days about Alyssa & Trevor's amazing wedding day. But I want to end it here just saying thank you to the both of them. It's weddings like this that keep me inspired and loving what I do. Not just all the great lighting, location and small details and hard work they put in. But the people... Mom's, Dad's, Grandpas, Grandmas and the whole family. It's not often enough you come across families like this. To come into a job feeling like part of the team, part of the family is such a blessing. I wish them both the best in the captures to come. I know it's going to be a true love story. Marry someone who brings out the best in you. 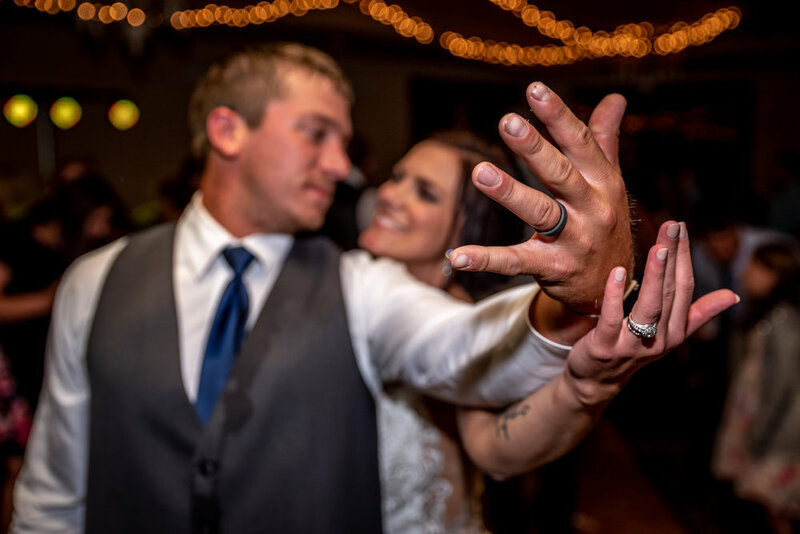 Justin + Angela: Not just another wedding video.